I want to offer you something different than the barrage of facts and figures around nuclear weapons. But let’s establish the basics. There are nine countries that possess them: France, China, the United Kingdom, India, Pakistan, Israel, North Korea and — of course — Russia and the United States. Together these nine countries possess a total of 14,575 nuclear weapons, with the United States and Russia accounting for 92 percent of them. Then there’s the outlandish nuclear weapons budgets and U.S. plans to modernize and upgrade current nuclear weapons stockpiles at egregious expense. According to a new government estimate, plans for modernizing and maintaining the nuclear arsenal will cost $494 billion over the next decade — an average of just under $50 billion per year. All of this is happening with Donald Trump in the White House. With his recklessness and overriding need to win — or appear to win — at all costs, he is more dangerous than his predecessors. And that’s despite the fact that every president of the nuclear age played a part in extending the nuclear nightmare and increasing the threat of global annihilation. Again, these are just the basics — things you already knew or aren’t terribly surprised to learn. That’s why I want to tell you a different story about nuclear weapons: My own. It comes through the lens of the nuclear fire and my relationships to the people who serve as a sort of bucket-brigade — offering sense, responsibility and sacrifice in an effort to douse the inferno. I am born. It’s a home birth to a nun and a priest — in the basement of a tall three-story row house full of anti-nuclear activists. On the day of my birth, the Bulletin of the Atomic Scientists’ Doomsday Clock stands at 12 minutes to nuclear midnight, moved back from 10 minutes in 1972 after the Strategic Arms Limitation Talks between the United States and Soviet Union developed a road map for reducing nuclear arsenals. I am blissfully unaware. 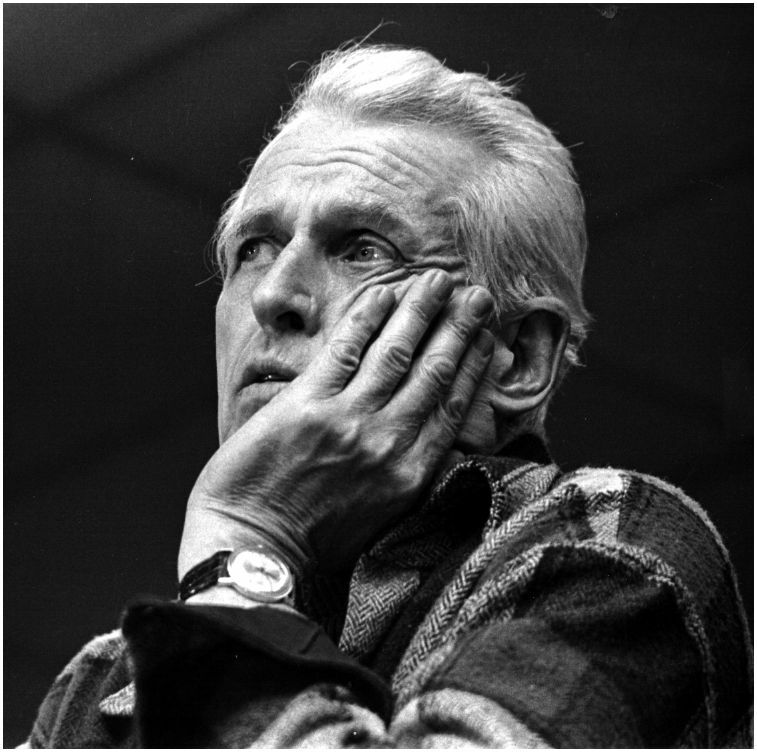 A healthy baby — the first of three — born to parents, Elizabeth McAllister and Philip Berrigan, who had set themselves on a course that maybe should have precluded children: a course of robust, muscular, creative, risky anti-nuclear resistance. Shaking “no” in its socket. The world’s rack for its own dismembering and flowering. Three days before my fifth birthday, the Three Mile Island Nuclear Power Plant suffers a partial meltdown. It is decades before I learn what that term really means, but the terror is real. Three Mile Island is less than 90 miles from our house and radiation is headed our way. My parents take my little brother and I to West Virginia — as far away as they could figure — for the better part of two weeks. We return to a changed diet: miso in hot water for breakfast every morning. My mother read that healthcare workers in Hiroshima drank the fermented soybean paste in water after the U.S. atomic bombing in 1945. They strengthened their immune systems and cleansed radiation out of their bodies with this ancient traditional Japanese food. Miso is brown, salty and is disgusting to the 5-year-old palate. But we drink it every morning for years. My parents start to look more deeply at the connections between nuclear weapons and nuclear power. There are nearly 100 nuclear power reactors across the United States, and they provide roughly one-fifth of the electricity produced in the country. Nuclear power is one of the dirtiest, most dangerous and most expensive sources of energy. Nuclear reactors in the United States and around the globe are plagued by accidents, leaks, extended outages, delayed construction and skyrocketing costs. Nuclear reactors produce highly radioactive waste that continues to threaten the environment and public health for thousands of years and for which no safe disposal exists. 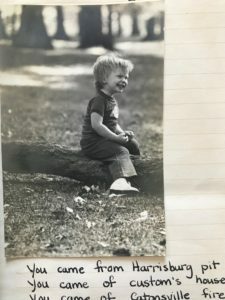 I am 6 years old and my brother is 5 when our father and seven others gain access to General Electric’s Nuclear Missile Reentry Division plant in King of Prussia, Pennsylvania. We commit civil disobedience at General Electric because this genocidal entity is the fifth leading producer of weaponry in the United States. To maintain this position, GE drains $3 million a day from the public treasury, an enormous larceny against the poor. We wish also to challenge the lethal lie spun by GE through its motto, ‘we bring good things to life.’ As manufacturers of the Mark 12A reentry vehicle, GE actually prepares to bring good things to death. Through the Mark 12A, the threat of first strike nuclear war grows more imminent. This GE advances the possible destruction of millions of innocent lives. This is a new kind of action, in the tradition of the Catonsville Nine (which two of the eight participated in) and the Hebrew prophets who enjoined peacemakers to beat swords into plowshares. We love our children and all children — that is why we are in resistance; that is why we are in jail. We cannot abandon the children; cannot render them to caesar for our immunity and comfort. And that love for them, and for the God who blessed us with them, will enrich their lives. So runs our hope. Fall 1980 finds us in school for the first time, at sea in a swirl of six-year-old politics that we do not understand. We are objects of fascination and derision to our mostly African-American classmates and regarded with pity by most of our teachers. They have been told what our father has done and — even though they know the details of the action and that he is a good person — they have less context for what he has done than we do. “What’s that, Jer?” our Dad asks. There were no presents from the Montgomery County Jail in rural Pennsylvania. This becomes an oft-told story in our household, used at various times to celebrate my brother’s thoughtfulness and sincerity or, at other times, to highlight our long downward spiral since that glorious apex of insight and righteousness. Our dad faces years in jail. In a February 1981 jury trial, he is convicted of burglary, conspiracy and criminal mischief and sentenced to 5-10 years in jail. It isn’t until April 1990 (when I am 16) that the Plowshares 8 wins some overturning of charges on a hard fought (and almost forgotten) appeal. Somewhere between action, trial and conviction, my sister Kate is conceived. My mom comes home from the doctor’s appointment — after finding out she was pregnant — and slugs a shot of scotch. More than 35 years later, before consulting Google, the details of the film were vague, but the outline is clear. The film imagines a nuclear attack on the United States and the lives of the people who survive its aftermath. After the film, we sat with our parents while our mom told us that she was going to do an action soon that would try and keep what the film depicted from happening. realities as part of the air they breathe. They have seen many people in the community in which we live, including their mom and dad, imprisoned for resistance to nuclear annihilation. But to have mom do something like this and to face her possible absence from their day to day lives for an indefinite amount of time — this was a large step. They were willing to accept the personal sacrifice of my absence as their part in trying to stop nuclear war from happening, as their part in trying to avoid the suffering that the movie displayed… They committed themselves to assuming more responsibility around the house, especially to be helpful dealing with the questions and fears of their little sister, who was not able to understand it as they were. It was a moment of extreme closeness for the four of us — a moment of accepting together whatever might come, and we concluded our conversation with prayer and big big hugs. Thirty-five years later, reconsidering this story as a parent myself, it strikes me as a very calculated move: a mom power play. But there we were. President Ronald Reagan watched the film a few weeks before it hit TV screens and wrote in his diary that the film was “very effective and left me greatly depressed.” Nearly 100 million people watched “The Day After” on its first broadcast, a record audience for a made-for-TV movie. But very few followed it up with an action like our mom’s. Mom is one of seven who enter the Griffiss Air Force Base in upstate New York in the early hours of the morning to hammer and pour blood on a B-52 Bomber. We did cry. Our mom serves 26 months in Alderson Federal prison in West Virginia. We fall into a rhythm of traveling there once a month for a long weekend. The powers that be conspire to make those weekends fall on every school field trip or fun excursion planned by our teachers. Our dad writes us long “please excuse my children from school” letters reminding our teachers every month that our mom is in jail for her anti-nuclear action. He sees it as an opportunity for education. We bypass this impulse and figure out a way to relate exclusively with the school secretary for early dismissals on these fraught Fridays. We are not the only kids with moms in jail, but we are the only ones whose dad writes polemics about it every month. We endure. It’s Easter Sunday. I am 14, and it is two days after my birthday. My dad is one of four activists who board the battleship Iowa in Norfolk, Virginia as part of a public tour greeting the vessel on its return from service in the Persian Gulf. 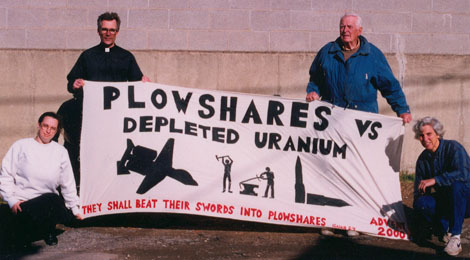 The four disarmed two armored box launchers for the Tomahawk Cruise Missile, hammering and pouring blood, and unfurled two banners: “Seek the Disarmed Christ” and “Tomahawks Into Plowshares.” It becomes known as the Nuclear Navy Plowshares action. My dad is sentenced to six months in prison. Another Easter Sunday. The day before I am to turn 17, and this time my father is in Bath, Maine, aboard the U.S.S. Gettysburg, taking part in the Aegis Plowshares action. The state declines to prosecute and charges are dismissed the day before the trial was scheduled to start. While not close to any birthdays or special holidays, it is the anniversary of Pearl Harbor Day. I am 19, in my second year at Hampshire College. The activists wade through marshes and over rough terrain to gain access to the tarmac at Seymour Johnson Air Force base in Goldsboro, North Carolina. There they hammer on an F-15 fighter plane before being surrounded by hundreds of armed soldiers who were engaged in war game exercises at the time. They call themselves the Pax Christi-Spirit of Life Plowshares. The trial the next February was notable to some people because the judge enforced a gag order and refused any mention of the political or moral justification for their actions. It was notable to me because my college boyfriend was able to attend. I was trying to integrate the various pieces of my life and not just slip the letter to the school secretary any more. Visiting him at the county jail in the midst of the trial, my dad says, “Was that Him in the courtroom?” I nod, nervous and proud at the same time. “Seems a bit of a hippie, doesn’t he?” my dad observes. And that was that. My dad is one of 6 who boards the U.S.S. Sullivans, a nuclear-capable Aegis destroyer at Bath Iron Works in Maine. They hammer and pour blood on different parts of the battleship. As they read their action statement and unfurl a banner, armed military security forcibly push them to the deck and place them under arrest. 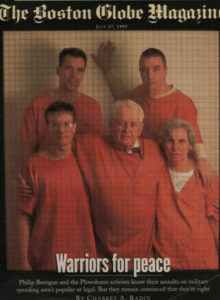 Cover of the Boston Globe Magazine from 1997 featuring (back row, from left to right) Steve Kelly and Mark Colville and (front row, left to right) Steve Baggerly, Phil Berrigan and Susan Crane. They call themselves the Prince of Peace Plowshares, and they are tried in May and sentenced in October. My dad is sentenced to two years in jail and told not to associate with any other felons except for his wife. He pays this no mind. He is 74 years old at the time. I had finished college the month before and moved home. In that brief time before his action, we spent our time building a composting toilet to collect our “humanure.” I help him out on less controversial projects around the house, while looking for a job. He doesn’t understand why I want a job. He is flabbergasted. His daughter is in debt? I went to the most expensive college in the country (with a great financial aid package) and nobody had any money to put down at the beginning. I managed to get into college with encouragement from people outside of my nuclear family. Mom and Dad were not much help. It was hard to explain — to a man who went to college on the G.I. Bill after World War II and then graduated school as a Josephite priest — the real cost of a college education. Awaiting trial after the action, Dad is in a county jail in Maine. Every time I go visit him, I upset the routine of local activists who visit him every week, and I feel awkward as they give me “private” time with my dad, grizzled and rumpled in his orange suit. Looking back now, forced to confront the patina of angst I’ve spread over all these memories, it occurs to me that we were deeply embedded in this life. I walk with my class at Hampshire College in May 1997 on a frigid day. We go straight from the graduation ceremony up to Maine to see Dad in jail. My brother graduates a few weeks later. Our sister graduates from high school the next year. He misses it all. I recently poured through my high school and college journals — thick, precious times that show how much time I had to process my experiences before social media or small children. I looked for hard evidence of the bereavement I tend to lay atop my parents’ absences. But it wasn’t there, or it was so between-the-lines that my 44-year-old eyes couldn’t see it. Looking back now, forced to confront the patina of angst I’ve spread over all these memories, it occurs to me that we were deeply embedded in this life. It was who we were and what we did. We did not question it. And while we missed our dad (mostly) and our mom (earlier), we included them in everything. We recounted it all in letters and visits. We saved the best parts for them. In some sense, our experiences weren’t entirely real until we shared them with our dad or mom (whoever wasn’t physically there). By this point, I am living in New York City. I have an apartment in Brooklyn and a boyfriend who is not a hippy. In fact, he has gained my dad’s grudging regard. I also have a job at the New School for Social Research, where I work for an arms analyst and public intellectual named William Hartung. At college, my friends and I had joked about becoming public intellectuals like Edward Said or Eqbal Ahmed, and now here I am earning money to pay attention to the military industrial complex. I feel incredibly lucky and very uncomfortable with my good fortune. I know all about depleted uranium — the radioactive byproduct that is used as a covering on munitions to give them armor-busting capabilities. Some of my favorite times with my dad are trading bad news story for bad news story. He is reading (and enjoying) the many articles I am writing and publishing. He occasionally enjoins me to not have such a secular voice and to end my articles for In These Times or The Progressive with a Jesus quote. I demure. I knew this action was coming, and I asked him to sit this one out. I did not offer to take his place. I am 76 years old, a married Catholic priest, with 35 years of resistance to the empire’s wars, nine years of imprisonment, numberless arrests, surveillance and ‘dirty tricks’ from the FBI… Enter my friends, sometimes brusquely: ‘Hey Dads!! Give it up to the young pups. It’s rocking chair time…’ But, but, but… I cannot forget the dying children of Iraq, and the two million Iraqis dead from our war, sanctions and depleted uranium… I cannot forget my country’s war psychosis — its obsession with better tools for killing, its mammoth war chest, its think tanks and war labs. He serves some of his sentence in a youth facility in rural Maryland. My brother, sister and I visit him there often. (There is an outlet mall nearby). He is the only white person in the visiting room — save for some of the corrections officers. The visiting room was designed for discomfort. It has this chest-level barrier between the inmates and the visitors, and you can’t lean on it to be closer to your family member. It is brutally loud. The boys all call him Pops and show him concern and respect. At some point, he was moved to a jail in Ohio that is more age appropriate, where we visit as often as we can. He is released right before Christmas 2001. Friends welcome him back to “minimum security.” He dies less than a year later, on Dec. 6, 2002. Over most of the next decade and a half, our mom continues to live in the community she formed with my dad and others and continues to bear witness at the Pentagon, the White House and other sites of power. She keeps animals — goats, llamas, donkeys, even sheep for a while, and starts painting again. She is arrested repeatedly, but not for any big actions. I leave New York City for a small town in eastern Connecticut, get married and have three kids. My brother and sister settle down too. My brother has three kids, lives in a Catholic Worker community in Michigan that he founded with his wife and another couple. My sister studies to be a physical therapist, becomes a doctor, falls in love with a doctor of English and lives in Grand Rapids. We are all arrested occasionally, but not for any big action. We march, we organize, we speak. We try. As our mother approaches and passes 70, we — like many people our age — start encouraging her to take it easy, give up the rigors of community life and resistance, the constant hosting and demonstrating. We envision and invite her to live a life with her grandchildren, stories, bedtimes, sporting events and art projects. We have room, we all say. She goes in the exact opposite direction. 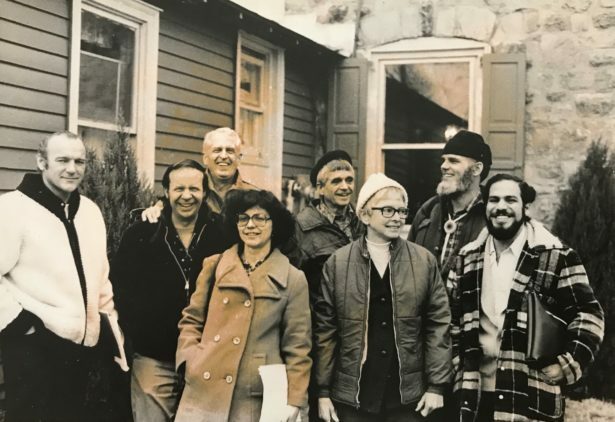 With others taking the reins at Jonah House, she feels free for the first time since our father’s death to be a Plowshares activist again, to conspire with her friends and to plan for a rigorous and daring action. We don’t know the specifics, but as all her answers about the future muddle into a very specific kind of vagueness, we know exactly what is going on. “You are too old,” we say. “Think of your grandkids,” we say. 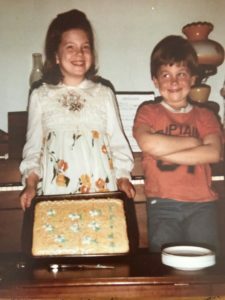 It was just three days after my 44th birthday, which was also Easter — again. We received word of a new plowshares action. 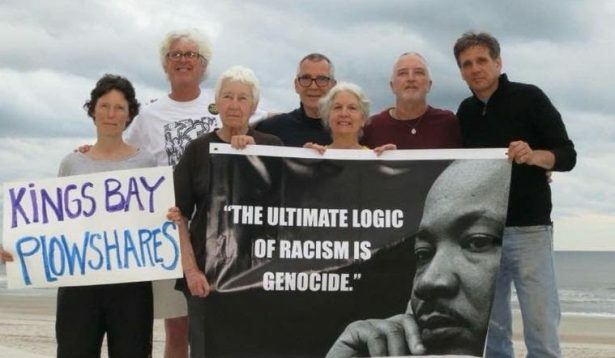 Seven Catholic activists entered Kings Bay Naval Submarine Base in St. Mary’s, Georgia. 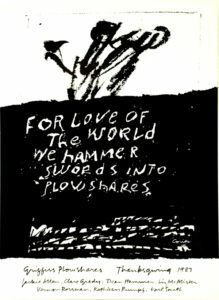 They went to make real the prophet Isaiah’s command to “beat swords into plowshares.” The seven chose to act on the 50th anniversary of the assassination of Martin Luther King, Jr., who devoted his life to addressing what he called the “triple evils of militarism, racism and materialism.” Carrying hammers and baby bottles of their own blood, the seven attempted to convert weapons of mass destruction. They hoped to call attention to the ways in which nuclear weapons kill every day, just by their mere existence and maintenance. They are charged with three federal felonies and one misdemeanor for their actions. They could face 25 years in prison if convicted on all counts. My mother feels very useful in jail — generous, empathetic and calm in a place that encourages none of those qualities. And there they still are. Three — my mom, Father Steve Kelly and Mark Colville — remain in county jail almost a year later. They still do not have a trial date. The other four are out on bond, wearing ankle monitors and are required to check in with their minders at regular intervals. The Kings Bay Naval Station is home to at least six nuclear ballistic missile submarines. Each carries 20 Trident II D 5 MIRV thermonuclear weapons. Each of these individual Trident thermonuclear weapons contains four or more individual nuclear weapons ranging in destructive power from a 100 kilotons to 475 kilotons. To understand the massive destructive power of these weapons remember that the nuclear bomb dropped on Hiroshima was a 15 kiloton bomb. The wheels of justice grind very slowly in Georgia particularly because the activists are mounting a creative legal defense. They seek to portray their actions as protected under the freedom of religion, using the Religious Freedom Restoration Act, which allowed the homophobic cake makers to not make a cake for a gay couple. They are seeking to demonstrate their “deeply held religious beliefs” and how the practice of their religion has been burdened by the government’s response to their actions. The Religious Freedom Restoration Act requires the government to take claims of sincere religious exercise seriously. Please keep them in thought and prayer. The clock has never been closer to nuclear midnight in my lifetime. All the work, all this sacrifice, and the clock keeps moving closer to midnight. 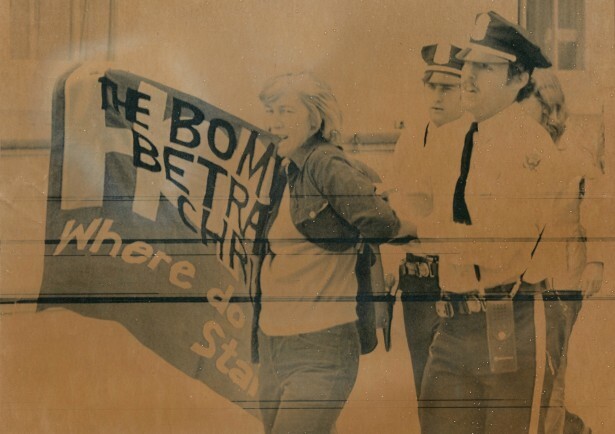 My mom’s action and extended incarceration pre-trial come as nuclear conflagration seems more likely. Nuclear weapons do not even rate in the list of top 10 fears that Americans are questioned about every year. Putin and Trump have shredded the imperfect and imbalanced but nevertheless important fabric of nuclear arms control treaties. Putin claims that Russia is developing a new class of “invincible” nuclear weapons, including a cruise missile that can reach anywhere in the world. The Pentagon signaled recently that the United States would begin tests on a couple of types of missiles. And just to make things truly terrifying, Anthony Cordesman of the Center for Strategic and International Studies says that in response to U.S. and Russian actions, China is improving its own nuclear arsenal. Searching for signs of hope to counter as a bulwark against these mounting fears, I hold close the work of the International Campaign to Abolish Nuclear Weapons, or ICAN. It developed the Treaty on the Prohibition of Nuclear Weapons and is now building a global civil society coalition to promote adherence to and full implementation of the nuclear weapons ban. ICAN received the 2017 Nobel Peace Prize “for its work to draw attention to the catastrophic humanitarian consequences of any use of nuclear weapons and for its ground-breaking efforts to achieve a treaty-based prohibition of such weapons.” I draw hope from that movement. Nuclear weapons ruined my life. I am never not thinking about them. Nuclear weapons are present in my most mundane tasks. Nuclear weapons are present in all my major relationships. Every goodbye and hello is freighted with uncertainty. They have shaped how I think about time. Nuclear weapons have caused me to honor and treasure the present. They have made the future provisional, muted, not taken for granted. I try to be present to the present and hold the future loosely, but with hope. Nuclear weapons ruined my life. And I wouldn’t have it any other way. In fact, I hope they are ruining your life too. Because that is the only way we are going to get rid of them. 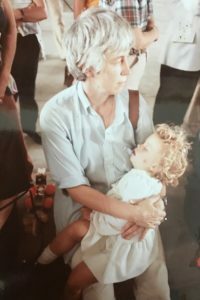 Frida Berrigan is a columnist for Waging Nonviolence and the author of It Runs in the Family: On Being Raised by Radicals and Growing into Rebellious Motherhood. She lives in New London, Conn. with her husband Patrick and their three children. 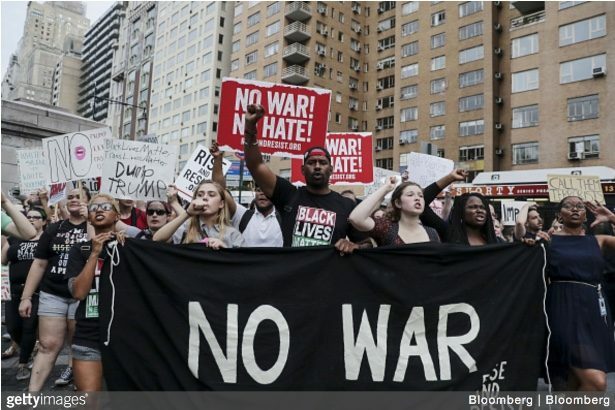 This article was published on April 4 at Waging Nonviolence.